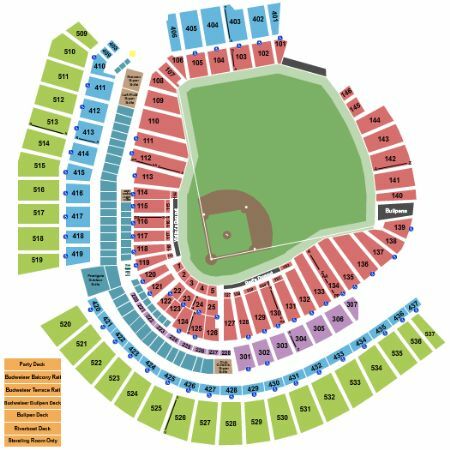 Cincinnati Reds vs. Milwaukee Brewers Tickets - 9/26/2019 - Great American Ball Park in Cincinnati at Stub.com! Tickets will be ready for delivery by Sep 22, 2019. Does not include admission to event. Tickets will be ready for delivery by Sep 22, 2019. Lot 31 - 500 Eggleston Ave.
Tickets will be ready for delivery by Sep 24, 2019. Second row. Visiting teams side. Sixth row in this section. These seats are directly behind the visiting team dugout within the first ten rows. Ninth row in this section. These seats are directly behind the visiting team dugout within the first ten rows. Tickets will be ready for delivery by Sep 23, 2019. Eighth row in this section. These seats are directly behind the visiting team dugout within the first ten rows. Ninth row in this section. These seats are directly behind the visitors on deck circle within the first 10 rows. Tenth row in this section. These seats are directly behind the visitors on deck circle within the first 10 rows. Ninth row in this section. These seats are directly behind the home team dugout within the first ten rows. Seventh row in this section. These seats are directly behind the home team on deck circle within the first 10 rows. Includes access to Scouts Club with private concession stands in a climate controlled environment. Padded Seat. Second row in this section. These seats are directly behind the home team dugout within the first ten rows. First row. These seats are on the aisle with purchase of the entire group. Visiting teams side. Includes access to Scouts Club with private concession stands in a climate controlled environment. Padded Seat. Second row in this section. These seats are directly behind the visiting team dugout within the first ten rows. First row. Home teams side. First row in this section. Includes access to Scouts Club with private concession stands in a climate controlled environment. Padded Seat. These seats are directly behind the visiting team dugout within the first ten rows. Does not include admission to event. Tickets will be ready for delivery by Sep 25, 2019. First row in this section. Includes access to Scouts Club with private concession stands in a climate controlled environment. Padded Seat. These seats are directly behind the home team dugout within the first ten rows. First row. Home teams side. Includes access to Scouts Club with private concession stands in a climate controlled environment. Padded Seat. Standard Hotel Package includes 2 nights at a 4-Star hotel near the venue (check-in day before game, check-out day after game) | Dugout Box game ticket in the first 5 rows of sections 114 thru 132 featuring access to the climate-controlled Scouts Club, wide padded seats and more (orders of three or more may be split) | $25 food/beverage credit included with each ticket | MLB merchandise of your choosing valued at $50 per person redeemable online only | Ticket upgrades - additional hotel nights or specific days may be obtainable upon request | Rate is based on double occupancy | Orders for a quantity of one are subject to an additional charge |. Deluxe Hotel Package includes 2 nights at a 4-Star hotel near the venue (check-in day before game, check-out day after game) | Roundtrip airport transfers | Game ticket with VIP amenities in Diamond Seats sections 1 thru 5 featuring access to the exclusive Diamond Club lounge with all-inclusive upscale buffet and drinks, in-seat service and more (orders of three or more may be split) | $25 food/beverage credit included with each ticket | MLB merchandise of your choosing valued at $50 per person redeemable online only | Ticket upgrades - additional hotel nights or specific days may be obtainable upon request | Rate is based on double occupancy | Orders for a quantity of one are subject to an additional charge |.